Moroccan Caravan is owned by Addi Ouadderrou, Amazigh (Berber) a native of Morocco and based in Somerville/Boston, Massachusetts, United States. The Moroccan Caravan always carries authentic high-quality arts and crafts. We care about our friends and customers, we treat them as if they were part of our family and share with them the warmth of Moroccan hospitality. We want you to get things just like the ones we use in our homes. 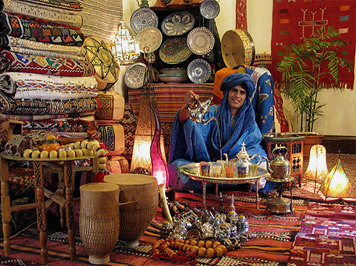 Please keep in mind that shopping at Moroccan Caravan means directly helpping Moroccan artists, keeping alive ancient art forms for everyone's enjoyment. We adjust so that our customers pay a friendly s/h rate based on zipcodes, especially when multiple items are combined in the same order. Website design by Brave Mettle Inc.